A hole had been dug in a concrete walkway at a hospital in order to repair a leak. The walkway was a busy access route to the hospital kitchen and restaurant. 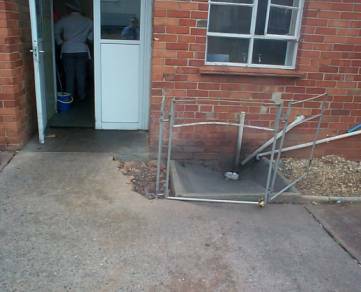 Five months later the hole in the walkway had still not been repaired, nor was it properly protected despite repeated requests to management from staff in the catering department. When a catering assistant pushing a trolley tripped on the dug up walkway she fell into the shallow hole and sustained injuries that kept her off work for several months. Only after the catering assistant was injured were the necessary repairs carried out to restore the surface of the walkway. A Health and Safety Executive Inspector investigated the accident. The Inspector concluded that the hole was an obvious and significant hazard and on a busy thoroughfare. The risk was known to the employers (the NHS trust) having been created by them and brought to their attention on a number of occasions before the incident. There was evidence of several ‘near miss’ or minor injury incidents involving the hole prior to the catering assistant’s accident and there were indications that repair work on the walkway was deliberately delayed so that several jobs could be ‘batched’ together. The Inspector served Improvement Notices on the trust requiring them to carry out risk assessments of all their pedestrian traffic routes and floors – a task that they should already have carried out as a routine good management practice. The Inspector also prosecuted the trust for breaches of the Health and Safety at Work etc Act 1974 and, on hearing the trust plead guilty to the offence, the court imposed a penalty of a fine plus costs totalling more than £7000.